Serving God in a remote corner of nineteenth-century England was a man who had made it his great aim “to live Christ.” He was a man of God that made such an impact upon the world he lived in that it was said he would have letters mailed to him from overseas, which included nothing more than, “R.C. Chapman, University of Love, England” on the outside of the envelope, and it would find its way into his hands. He became known as “The Apostle of Love” to the generation that God had called him to minister to. This article is a lengthy one, due to the fact that it is an article on one of my heroes of the faith, R.C. Chapman. This man's life has greatly impacted my philosophy of pastoral ministry, and encouraged me enormously to follow his example as a man of God. Robert Cleaver Chapman (1803-1902) was born January 4, 1803 in Elsinore, Denmark. He was born into a wealthy family who had made their fortune for many generations from the sea. His father Thomas moved the family to the town of Elsinore from Whitby, North Yorkshire – which just so happens to be the place where the famous Captain James Cook was apprenticed to the sea, and all four of his great ships were built. The Chapmans had been one of the leading families in the area of Whitby for many generations. In fact records show that the Chapmans settled in the area of Whitby during the reign of Henry III, before 1277. The family received its surname from the fact that its earliest members were “Chapmans” – buyers and sellers of merchandise. During that time, Robert Chapman, who was a merchant of York was given permission by the king of England to voyage to Denmark to purchase corn there do to the shortage in England. In the 17th Century, William Chapman – a contemporary of George Fox – declared his conversion, along with many of the Whitby Chapmans to Quakerism – which became a leading religious force in the town of Whitby at that time. Official Quakerism, however, forbid any of its members to bear arms for any reason at all, which produced a complex problem for those who owned ships and needed to protect themselves from pirates. The Chapman family chose to continue protecting their vessels and lives, and therefore they were excommunicated from the Quakers. However, they still considered themselves Quakers, and formed a less strict sect of the group in a nearby village to Whitby. Over the next 200 years the Chapman family was influenced by Quakerism, Anglicanism, as well as Roman Catholicism, though none of them seem to have ever been too important to anyone in the immediate Chapman family. During the eighteenth century the Chapman family was a part of the aristocrats in the area around Whitby. Most of the Chapmans were connected in some way to the sea where much of their fortune was made. Robert Chapmans’ father, Thomas Chapman, ran a prosperous merchandising business. Robert grew up in a large, immaculate looking home, where a staff of servants catered to he and his families needs. He had a stable of horses, a coach bearing the family coat of arms, as well as many other luxuries of the day. Robert Chapman was devoted to his mother, and as an adult admitted that he cared little for anyone else as long as she was near him. It was said of Robert by his mother, “Robert always has a passion, whether literature or the flute, and whatever he takes up, he pursues diligently.” While other members of the Chapman family ridiculed him by saying, “Robert is such a philosopher. He won’t do much.” This antagonism did not stop Robert from excelling in all that he did – in fact, it more than likely helped stir him up for greatness – as his track record would soon show. As a youngster he showed remarkable ability in languages. He would study a language until he mastered it. He spoke English, Danish, French, German and Italian. After his conversion to Christ he studied Hebrew and Greek so he could read the Bible in the original languages. Once the burden of missions was placed upon his heart he became fluent in Spanish and Portuguese as well. By the time Robert became a teenager, the father’s business faltered – mainly due to the Napoleonic wars in which Denmark sided with France. As a result of the French Revolution, Napoleon ordered all the ports under his control to close their markets to Britain. Due to these circumstances Thomas Chapman lost a great deal of money and was forced to close his business and move back to Yorkshire. This turn of events did not leave Thomas impoverished – however, his family could no longer maintain its former standard of living. Now that the family fortunes were only a fraction of what they previously were, Robert would have to give up his dream of becoming a poet, as well as his desire to pursue knowledge through books, becoming a prolific writer, and attaining scholarly achievements in life. He would now have to “earn” a living like the rest of the world. Robert Chapman left home in 1818 when he was 15 years-old, to begin an apprenticeship with an attorney. Robert was intellectually mature beyond his years and quickly excelled in his new chosen field. As an apprentice his training consisted of copying legal documents, studying legal precedents, court cases, procedures, and all other aspects of the field that is required to become a lawyer. Even though Robert had a full plate with his legal studies, as well as his growing religious concerns, he still managed to have an active social life. His family connections opened many doors for him. On weekends and holidays he would often be seen at parties in London’s fashionable West End. He was tall, witty, articulate, and had a deep resonant voice, which made him quite popular amongst the socialites in his town. After his five years of legal apprenticeship was over, at the age of 20, he became an attorney of the Court of Common Pleas and an attorney of the Court of the King’s Bench. By the age of 23 he inherited a small fortune and set up his own law practice in the banking center of London. He was successful from the beginning, even receiving the praises and encouragement from older lawyers. A brilliant future seemed imminent for this young man’s future. “Sick was I of the world, hating it as vexation of spirit, while yet I was unable and unwilling to cast it out” (Peterson, 1995:21). Chapman was outwardly happy and friendly, but inwardly, he was a man in constant turmoil, struggling to make since of the life he was living and the direction he should be heading. John Whitmore, a fellow lawyer was quite impressed with the 23 year-old Chapman. Whitmore was a Christian businessman and a deacon at one of the local non-denominational churches, called John Street Chapel. He noticed quickly that Chapman appeared to be very pious, liked to dialogue about religion, and seemed to know his Bible quite well – but at the same time spoke judgmentally about it. John Whitmore soon realized that Chapman was searching for spiritual answers and had yet to find them. John Whitmore extended an invitation to attend church with him to hear Pastor Harington Evans. That is where Robert Cleaver Chapmen would hear the sweetest words that would ever touch his soul. It would be the place where the Word of God would finally travel downward from his head into his empty heart, penetrating to the depths of his tormented soul. John Street Chapel would be the birthplace of a Christian giant, a man whom if God allowed, would be written in the pages of Hebrews 11, talked about in 1st Corinthians 13, and spoken of as a hero in the book of Acts. For the first time in his young life, Robert Cleaver Chapman would hear a sermon that would open the eyes of his heart. He would hear that every man is justified before God by faith in Christ alone. As he sat and listened to the powerful message from Harrington Evans, his intellectual reservations “melted under the convicting power of the Holy Spirit.” That night Robert Cleaver Chapman gave his life to Jesus Christ and from that moment on, his life would never be the same. “I remember the time when I was afraid to die…. But on coming to Christ and being saved by Him, I passed from that state to another, that of being afraid to live, for I feared that if I lived I might do something that would dishonor the Lord, and I would rather die a hundred times than do such a thing. But thanks be to God, I did not remain long in this state, for I saw clearly that it was possible to live in the world without dishonoring God” (Peterson, 1995:27). “There are many who preach Christ, but not so many who live Christ. My great aim will be to live Christ” (Peterson, 1995:29). When reading through what little work has been left by Chapman – it seems apparent that he was able to develop a profound preaching ministry – though, it is without question his great aim of living for Christ that has left the most impacting mark upon this world. Robert Chapman continued in both his legal profession – which was becoming increasingly more successful – and at the same time his work at John Street Chapel. By the age of 29 he was feeling an overwhelming desire and calling from God to leave the world that he knew behind, to go and pastor a church, or even become a missionary to Spain or Italy. In April of 1832 he received an invitation from a Baptist church in Barnstaple to become their pastor. He didn’t hesitate to leave behind all prospects of earthly advancement, and must have been completely persuaded by God that this was to be his life’s work because he gave away his private fortune and his inheritances, keeping only enough to purchase a modest home in the city he would now pastor in. R.C. Chapman, as he became known as, began studying the Bible with passion and with a new understanding. He would later write: “The book of God is a store of manna for God’s pilgrim children. . . . The great cause of neglecting the Scriptures is not want of time, but want of heart, some idol taking the place of Christ. Satan has been marvelously wise to entice away God’s people from the Scripture. A child of God who neglects the Scriptures cannot make it his business to please the Lord of Glory; cannot make Him Lord of the conscience; ruler of the heart; the joy, portion, and treasure of the soul . . . If the Bible be used aright by anyone, it will be to him the most pleasant book in the world” (Peterson, 1991:15, 16). “Some said that when Chapman sat around a table to study the Bible with others who might well be accounted great students, he towered above them all. Henry Dyer once likened Chapman’s ministry of the Word to an eagle taking flights in the heavens. He was above the clouds. “You can only catch sight of him occasionally,” Dyer said. He added, “Robert Chapman in his preaching distributed nuggets of gold….These nuggets the hearers had to beat out for themselves, and the more they were beaten, the more was seen in them”” (Peterson, 1995:188). Chapman believed that “Every error may be based upon some part of Scripture taken from its connection; but no error can stand the test of all Scripture.” He did not trust anyone else’s writings until he proved their consistency with the Bible. “Chapman, together with George Muller and a small number of other leaders among the Brethren, did not believe that the Scriptures told of a secret rapture of all believers before a period of great tribulation on earth. They believed that the church as a whole must go through the period of tribulation. William Hake (Chapmans friend and co-laborer) did not agree with Chapman’s views and once told Chapman of a conversation he had with someone who was assured that the Lord might come (initiating the rapture) at any moment. Chapman replied, “Well, brother Hake, I am ready, but it’s not in the Bible”” (Peterson, 1995:171). Though Chapman was not open to changing his mind about this particular view of eschatology, especially at the age of 93, when much of his congregation were now on board with the eschatalogical view of a pretribulational and pre-second coming view of the rapture – a teaching many believe originated with John Nelson Darby – a contemporary of Chapmans – we see the love of Christ displayed in Chapmans actions when it came to God’s people. It is said that he held a meeting with the elders of his church and said, “I have called you together to explain that I shall not create dissension by teaching the opposite view in the Assembly” (even though it was a new view, to a church he had been pasturing for over 64 years), Chapman still saw the bigger picture in God’s economy, and that was to show the world the love of Christ. “Thy brethren, Lord, are my delight, I love them strong or weak; they all are precious in my sight, the forward with the meek. I serve them, Lord, for they are Thine, the Fathers gift to Thee; The Spirit, by Thy Blood divine, from prison set them free. And still the forward ones I serve – Thy members, Lord, are they; Hold Thou me up, nor let me swerve from Love’s excelling way” (Peterson, 1991:32). When it came to disputes, and quarreling within the Body of Christ, there is one particular statement by Chapman that I have memorized, and referred to on several occasions throughout my life in ministry for the Lord. “If I have been injured by another, let me think to myself, how much better to be the sufferer than the wrongdoer…My business is to love others and not to seek that others shall love me... God is love (1 John 4:16), His children please Him only so far as they are like Him, and ‘walk in love’ (Eph. 5:2)” (Peterson, 1991:41; 1995:13; 1991:11). Chapman knew that the love of Christ being lived out in the Church is what wins souls to the Kingdom of God. He knew that it was a changed life that attracts the lost. “Our joy in Christ speaks a language that all hearts can understand, and is a testimony for Him, such as mere knowledge and utterance can never give” (Peterson, 1991:19). One of the most important lessons that I have learned from this incredible man of God, is his deep love for Christ’s church. Hosea 11:4 states, “I drew them with gentle cords. With bands of love, and I was to them as those who take the yoke from their neck. I steeped and fed them.” I see this characteristic in the life of R.C. Chapman. Not only was he a man who lived as Christ, but he also loved as Christ. One practical way that he was able to do this, was by turning his home in Barnstaple into a hospitality house to give a place of rest to any weary saints or missionaries that may have passed through town. “He would instruct them to leave their footwear outside their doors so that he could clean them by the next morning. Typically they objected to his doing such a menial task, but he was quite insistent. One guest recorded Chapman’s answer to his objections: “It is not the custom in our day to wash one another’s feet; that which most nearly corresponds to this command of the Lord is to clean each other’s boots”” (Peterson, 1995:82). It was also recorded that a worker in Hudson Taylor’s ministry in China, J. Norman Case, found out about Chapman’s hospitality house and the impact it was having upon God’s people who had been there. “The whole ordering of the household had in view not only the comfort, but the general spiritual, mental, and physical well-being of the many who came there for rest. It struck me at the time as being in its arrangement and conduct an ideal Christian household. The wisdom of retiring and rising early was forcibly taught by precept and example. Love and reverence for the Scriptures, and subjection thereto, formed the very atmosphere of the house. There, too, the “table-talk” was turned to spiritual ends as I have never to the same degree elsewhere known. An ordinary meal became an agape, more helpful than many a long meeting. The living was plain but good. It was recognized fully that the body was the Lord’s, and should be treated accordingly. It was an ideal home for a tired or discouraged worker, or for a despondent or perplexed Christian. There one seemed naturally to be in that state of mind to hear the question and heed the exhortation to one of old: “Seekest thou great things for thyself? Seek them not.” A stay there of days or weeks could not but deeply influence the whole aftercourse of a young Christian” (Peterson, 1995:82, 3). “Chapman frequently told people that he had many trials of faith but that trials are sent to strengthen faith. His retreat for the Lord’s servants was one arena in which his faith was tested. Often his guests or their friends sent money or provisions to Chapman. Sometimes, however, provisions ran low and there was no money to buy supplies. Anxious when he first started his hospitality ministry, Chapman came to understand that God was arranging things for each day. When the funds ran out, he would pray about it and soon there would be money for food. Childlike dependence on God became a habit and he tried to convey to his friends that this was the natural attitude of a child of God” (Peterson, 1995:81). “Muller frequently sought Chapman’s legal as well as spiritual advice. In 1834 he had set up the Scriptural Knowledge Institution for Home and Abroad. . . “to assist and establish new day schools, Sunday schools, and adult schools in which instruction is given upon Scriptural principles.” But soon the plight of homeless children was pressed upon his mind and he wondered whether he should support them through the institution. When he became convinced that the Lord would have him set up an orphanage, Muller consulted with Chapman and decided that funds would not be solicited for an orphanage. If the Lord wanted such a work to go forward, He would speak to the hearts of Christians to supply the funds. Thus began a faith work that resulted ultimately in a large and well-known orphanage system, and Chapman became one of its first trustees” (Peterson, 1995:202). “In 1845 Muller asked Chapman’s judgment on the wisdom of greatly expanding the orphanage work. Funds for maintaining the work in the central part of Bristol had never been plentiful but were always sufficient. It was by no means clear that a greatly increased work would be supported, even though Muller had felt God’s urging in this direction. Chapman encouraged him to proceed with the new plans. Muller recorded: “His visit was to me of great help in this particular, especially in stirring me up yet more to bring everything in connection with this matter before God. He also laid it on my heart to seek direction from God with reference to the plan of the building”” (Peterson, 1995:204). “Toward the end of his relatively brief life of fifty-eight years, Spurgeon became isolated from many Baptist leaders because of his outspoken stand against the growing popularity of so-called higher criticism. Chapman had passed through the agony of division within the Brethren movement and could well sympathize with Spurgeon’s anguish. Always the comforter, Chapman visited Spurgeon at his London home and was there again a short time before Spurgeon died” (Peterson, 1995:158). Spurgeon was also quoted as saying that R.C. 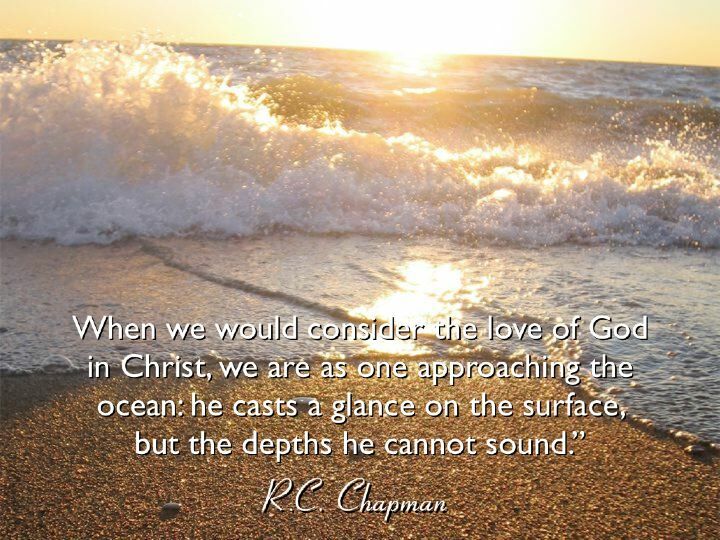 Chapman was the godliest man he ever knew. The Bible tells us that “Pleasant words are like a honeycomb, sweetness to the soul and health to the bones” (Prov. 16:24). This is no doubt the effect that the Apostle of Love had upon the Prince of Preachers. “In 1852 when the twenty-year-old J. Hudson Taylor, who was burdened for China, learned about the wisdom and missionary concern of Robert Chapman, he eagerly sought Chapman’s advice. . . . Chapman encouraged him and became on of CIM’s (China Inland Mission) first “referees” – supporters and advisers who answered inquiries about the mission. Chapman’s friend George Muller, through his Scriptural Knowledge Institution, also became a substantial financial supporter of CIM, which was underway by 1866. Taylor visited Chapman several times in Barnstaple. An undated letter from Barnstaple reads in Chapman’s characteristic style: “My dear brother Taylor, Consider our claim on you. We desire fellowship with you in your work. Oh! Come and speak to us your brethren here. Say when you can come….God delights to fill our open mouths.” When they met again in 1872, Chapman’s affectionate greeting was noted: “I have visited you every day since you went to China!” He had prayed for Taylor daily by name” (Peterson, 1995:158, 59). “The titles given to the Church in Scripture bespeak of heavenly unity, such as the body, the vine, the temple of God, a holy nation, a chosen generation, a royal priesthood. Such words set forth the Church of God as a witness for Him in the world; but the names which have been invented by men are names of sects, and declare our shame” (Peterson, 1995:23). “For those who are to exercise any office in the Church – that of evangelist, pastor – it is not knowledge and utterance only which are needed; but also, and above all, grace and an unblameable lifestyle” (Peterson, 1991:18). “The figure of the log in the eye shows what skill and tenderness he has need of who would be a reprover to his brother; who would trust so precious a member as the eye to a rough, unskillful hand” (Peterson, 1991:19). If our church today with its many divisions and sects could meditate upon this beautiful picture painted by the Apostle of love, and then apply it to our daily lives – what a work the Lord could do throughout the world! “So many people were touched by him that fame was inevitable. But he became famous against his wishes. He could have been a prominent religious writer, but he turned down many flattering offers from publishers. He resolutely set himself against doing anything that would bring his personality into prominence. His saying were compiled by friends without his knowledge, and he agreed to the publication of Choice Sayings only with the understanding that all proceeds would go to missions…. We may be disappointed in his reluctance to publish and his decision to destroy his personal papers, but these decisions were simply a true reflection of his personality” (Peterson, 1995:188). It is no wonder this man of God is not widely known some 100 years later. He was a man who did not seek his own glory, but the glory of God alone. His life resembled the heart of John the Baptist who so profoundly stated, “He must increase, but I must decrease” (John 3:30). Yet, the ministry of Robert Cleaver Chapman lives on in the lives of so many of us who have been impacted not only by him, but also by those great men of the faith in whom he impacted for Christ, such as John Nelson Darby, who was the leader of the Plymouth Brethren, George Muller, the great man of faith and defender of the orphan, Charles Spurgeon, the Prince of Preachers, J. Hudson Taylor, the missionary to China, and every dear saint that each of these incredible men have impacted because of the life of this unsung hero, R.C. 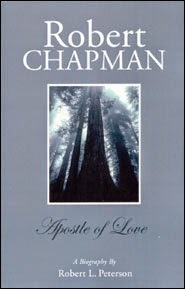 Chapman – The Apostle of love. Peterson, Robert L. Robert Chapman. Loizeaux Brothers, Inc. Neptune, NJ. 1995.